Of all the 118 elements in the periodic table, there is one that has continually stood out from the rest. Gold, the most precious and beautiful of all metals, has been highly valued throughout mankind’s history and continues to capture the hearts and minds of people all over the world. For thousands of years people have been captivated by this precious yellow metal but why is it so popular and why do people desire it so greatly? In many ways, gold is the perfect element. It is naturally beautiful, and it doesn’t react with anything, making it perfectly safe to use. It is also solid in form unlike a lot of other elements that are gases or liquids. Gold’s stunning yellow colour makes it unique amongst other elements on the periodic table as it is the only metal to naturally display a colour other than silvery grey or white. Gold’s colour is so unique in fact, that it even has a colour named after it. Gold is a great conductor of heat, light and electricity which is why it is used in everything from computer chips to mobile phones. Gold’s many conductive properties mean it is also very hard to find a substitute metal. Unlike some elements that might combust into flames or react unstably when combined with other elements, gold is almost completely non-reactive. It also doesn’t have any of the other negative traits that affect many elements – it is non-poisonous (You can even eat it without any negative effects) and it is non-radioactive. Gold is very malleable metal. Not only is it fairly durable, it is soft enough to easily shape into different things. You can also melt gold down relatively easily, unlike other precious metals such as platinum, which makes it easier to extract. One of the most beneficial properties of gold is that it doesn’t react with oxygen and so doesn’t tarnish in the same way that silver does. This makes gold the perfect metal for use in jewellery, and any other items you want to stay looking shiny and brand new. expensive to buy and so highly sought after. When people first started trading in gold, it was considered a scarcity and therefore had great physical value, which is one of the reasons why it has become such a highly regarded precious metal. Whilst gold is rare, it is not the rarest of precious metals included in the periodic table. 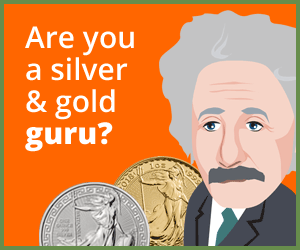 Metals such as platinum and palladium are actually far rarer. In the past, these metals would have been considered too rare to use as a currency which is why gold became the precious metal of choice. Physical Gold specialise in a wide array of gold investments suitable for all requirements. Whether you’re looking to invest in gold bullion or collectors’ coins we can assist. Why not call us on 020 7060 9992 to discuss your options for buying gold and precious metals. This entry was posted in Blog and tagged Gold value.